Peder Bjerkseth worked as priest in the small town Snertingedal from year 1917 to 1930. 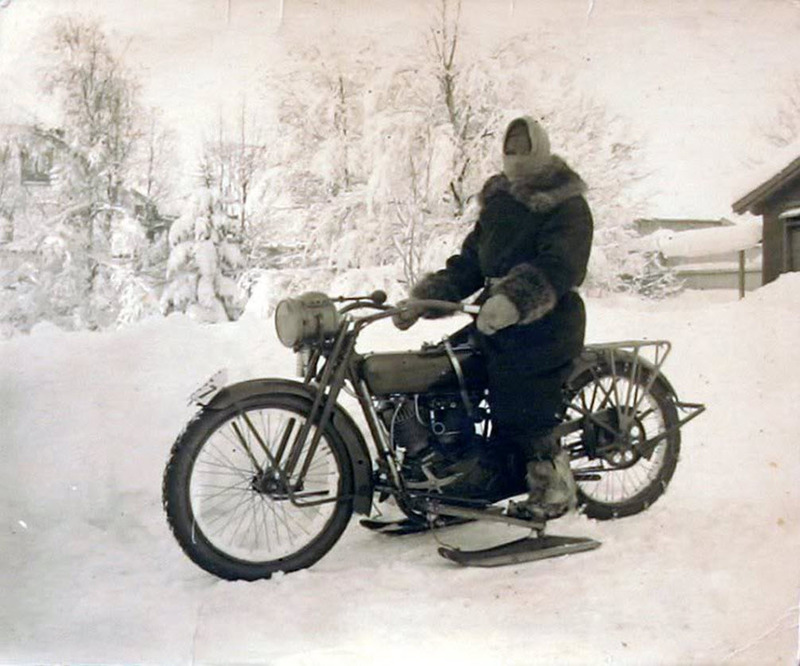 Peder was an enthusiastic motorcycle driver in his younger years. 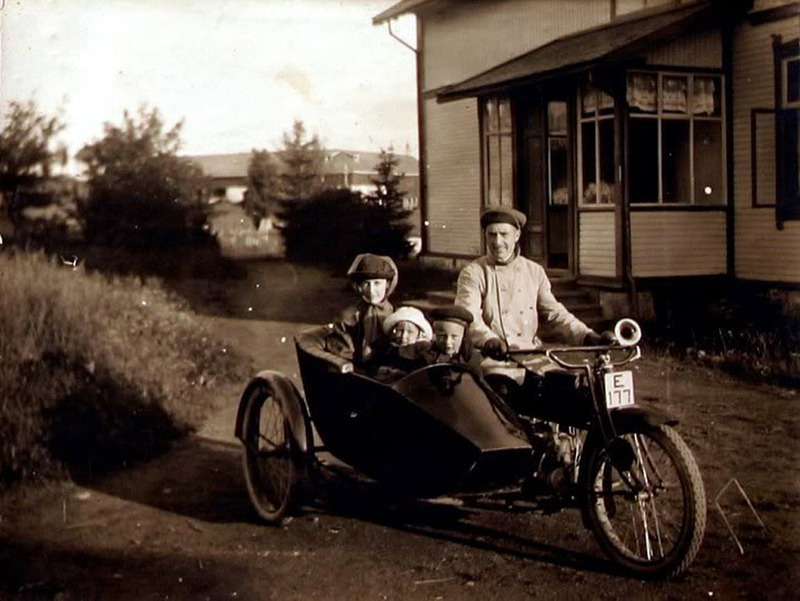 His first motorcycle E-177 where a Henderson from 1916 with a National sidecar. This must have let him down eventually in a few years as he in the later pictures shown operates a 1918-1919 Harley 61" (1000cc)IOE on the same E-177 plates. 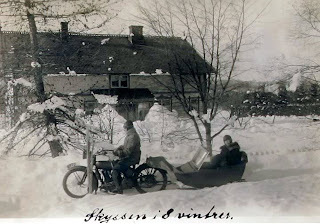 Another fact is the National car is now altered to work as a sled behind the Harley during the winter season. Peder ready to bring relatives home from a Sunday party. Wife and kids in the back. Peder with family in the sidecar. The Henderson is a bare magneto model, no lights just the ball horn to warn whoever gets in his way. 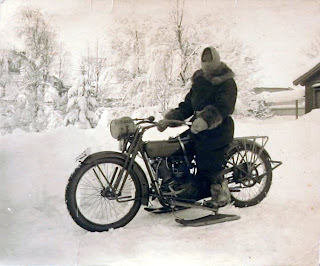 Peder have uppgraded himself to a "state of the art" Harley Davidson with skies for winter driving. Peder is well dressed to cope with the cold winter. Peders Harley beeing a magneto model is equipped with a unknown brand acetylene headlight. The National car previously attached to the Henderson is now degraded to a snow sled behind the Harley. 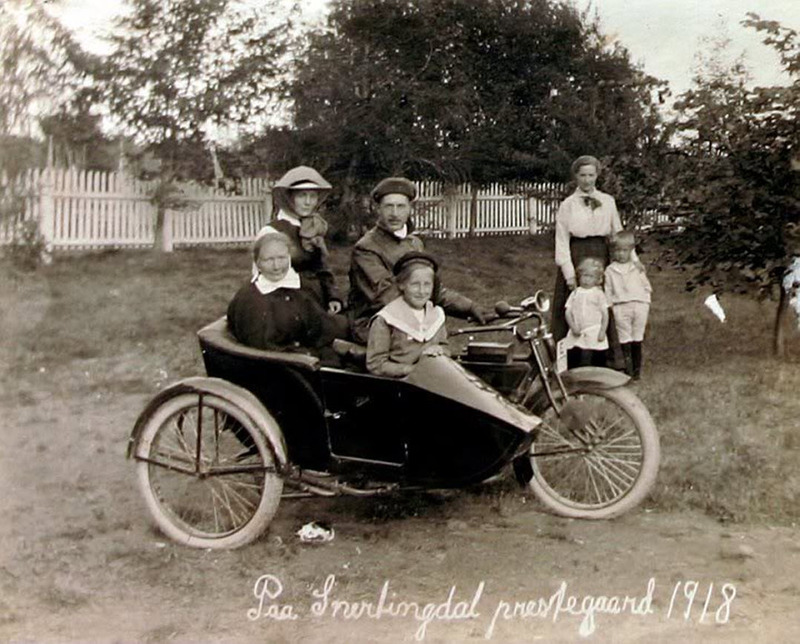 According the text on the picture this vehicle was the Bjerkseths family transport for eight years (winters). 11.11.2010; got an e-mail from my friend Nicklas in Sweden who states this Henderson is not a 1916, rather a 1917-18. OK, if Nicklas say so its for sure the truth as he knows most details on these early motors.